I'm back with a HUGE PILE OF ITALIAN BOOKS!!!!! WHEEEEEE!!!!! Quitting smoking and going out and eating out was so very worth the effort: I saved up and spent February in Italy, studying Italian, getting started on Latin and Roman history for school, getting an on-my-feet edumacation in art history, and SHOPPING FOR BOOKS!!! I could barely move my suitcase unassisted when I left, but now I have Calvino, Cesar Pavese, oodles of yummy Moravia, un giallo (detective novel; this specimen's a very noir, comic one, using the genre as a vehicle for the author's crotchetyness, so it's similar to what I'm writing), a big thick history of Roma, a history of the Etruscans, some contemporary stuff, an obscurish 'working-class' author I overheard some crazy sweet prissy nerd lady at the lefty bookstore raving about, what else... and a bunch of these terrific pocket editions of classical texts that have the Greek or Latin on one page and the Italian translation on the facing page mmmm...I'm about to come molten gold all over the floor... I feel like the queen of the world!!!!! Anybody ever go on vacation and come back with enough books to make coming home seem not all that depressing really because your brain can still be there? But I did informally test out, after 30 hours of class, at a "university-intermediate" level in Italian... if anybody wants a recommendation for a great Italian school in Rome, let me know. It's cheaper than the other schools, too. The teacher was my kinda grammar nazi. I love that sort of passion. Welcome back! It's super to hear from you again. I WONDERED where you were! Glad you had such a great time! Anybody ever go on vacation and come back with enough books to make coming home seem not all that depressing really because your brain can still be there? I've barely been anywhere, especially not anywhere I'd really want to stay, except for Canada—and yes, I did buy a bunch of books in Canada, but it's not quite the same; I've probably bought as many Canadiana books since I returned. But with foreign languages—I have never though about it in these terms, really, but it's a great idea! Ann, have you read Il deserto dei Tartari by Buzzati? and have you seen the film? there is an ilf thread on, and it stars max von sydow. oh would tht he wd post to ilx! Funny you should ask about Il deserto -- I picked it up on my trip! One of my first major reading projects in Italian was his Sessanta Racconti, which was intimidatingly thick but so full of weird creepy goodness that I forgot to be daunted. I'd wanted to read Il deserto for months but the scraggy copies available on Amazon stateside were about twenty bucks... I got it on sale for four Euros, ha! Ohhh! Dino Buzzati! You must read "Un Amore". It's really a great book! very, very funny and interesting is "le notti difficili" (Hard nights, maybe?). You should know some other things about his life to understand him better. Thank you... I would REALLY like to know what made Buzzati tick -- is Notti difficili autobiographical? I'm getting toward the end of Moravia's La Ciociara now and, since despite my best efforts I'm hopelessly absorbed in my own place and time, I can't help comparing the account of WWII Italy to WWNow U.S. In one part (careful, all of this is translated AND from memory) one character, an overeducated cynic, is watching as the Germans invade and bomb the Italian countryside; everybody's panicking and the cynic smiles and says "Weren't you guys all saying you didn't care whether the Germans or the English won, since they're all the same?" Kind of reminded me of the things people were saying after the dust cleared and Nader had helped Bush II win (yeah yeah, so he didn't really win it) his first election and then all hell broke loose. File under: history repeats... again. I got the only first of my university life writing about Buzzati. Happy days. Carlo Gadda anyone (ok-ish article in the LRB site), but what do ILB-ers think about him? There is probably too little available to form much of an opinion but it doesn't cost it to throw this out there. Searching through the ILX archives there are some things on Leonardo Sciascia. And I am going to be starting on Two Women by Moravia soon. Has anyone read anything by Ignazio Silone? Apparently he was a member of the italian Communist Party but there are accounts he worked for the fascists, but all that really compelling history aside does anyone have any recommendations? Digging Sciascia and have Silone's Fontamara as a library loan. Anyone read Vittorini's Conversations in Sicily? otm. I miss Ann Sterzinger. what happened to her? did she announce she was leaving or just stop turning up one day? vittorini's sicilia book is amazing. there's a film about it (?) by straub-huillet. amazing, too. Of course, we could be consoled in a minor way by reading her blog, which does convey a sense of why we would miss her enlightened misanthropy around here. or you could read her novel. or email her. Reading her novel seems like excellent advice, especially buying it before reading it. Emailing her seems too... presumptuous. Unless, of course, it were an email stating that one had purchased her novel, read it, and loved it. What author could resist such an email? Ha! I googled and found her blog the second time I revived this thread, its just hilarious and lovely really - is her book about the restaurant industry then? ;-) I should do some more googling. Then again I won't now I said that. Also thought of emailing her to come back and entertain and enlighten us, then thought better of it. Thanks moullet - I've done another IL loan earlier today, can't wait. Conversations in Sicily is brilliant (got the Alane Mason translation). Totally unique how it breaks down the language into an atomic simplicity of sound on the one hand and, then, on the other, how it then uses the building blocks for, well, conversations...gotta see the film. Elsa Morante - History is a classic. What should I go onto? Got Pasolini's A Violent Life, for the cover, but I'll get onto it someday. Another Italian author find is Artemisa by Anna Banti. So I likes me some Italian authors. ^Broadcast last night. A good watch (lots of lecturers from Italian departments: kept thinking that if this was made a year or two from now many of them wouldn't have a job in here. The historical narrative of 'murders don't get solved/the crime as a means of looking into fascism/etc' only held up to Sciascia. Anglo Noir's shtick is much more pronounced than many of they would like to admit by the time it got into Baraldi and Cataldo: a lot of revenge fantasy and unflinching violence straight out of old style hardboiled noir. Only Lucarelli's fascist cop sounds interesting. Malaparte anyone? Don't have access but might get this issue for that article by Edmund. For a start it says nothing about Leopardi (apart from saying it keeps the personal away = great to see an article mentioning he isn't a hunchback, which colours your view of where he is coming from) and talks about it as a piece of many more dimensions the John Gray penned New Statesman piece (which only talks about the bits that sound like John Gray). The only downside is how it makes a great argument for reading the whole thing and not skimming thru any bits around language, that all of it does form into a coherent set of arguments, mostly composed over a two year period. To add to the above I only say downside because I don't want to carry this around and I seriously can't be arsed with an ereader. Currently reading Malaparte's Kaputt and its turning out to be the best journalistic novel, not that are many? In that he stretches the imagery but the conversations feel reported and accurate in their savage content. I love and yet feel a repulsion toward the narrator, how he feels a sympathy for the poor and beaten, and yet he chooses to hang out with the victors. The reflections seem substantial, or at least not that novel: the Germans are frightened more by the weak than the strong. The reading is wide, attentive. Feels like Celine picked up on this for his trilogy? Or that's what a writer used to do...they make their choices, live them out, then survive a hanging to tell the world about it. Makes Morante's History: A Novel which I liked it at the time, seem a lesser work in the concentration of war and its effects on a mother and child, with the existential guy later on to provide wider reflection. - Picked up more poets: Quasimodo and Montale, see how I get on with that? 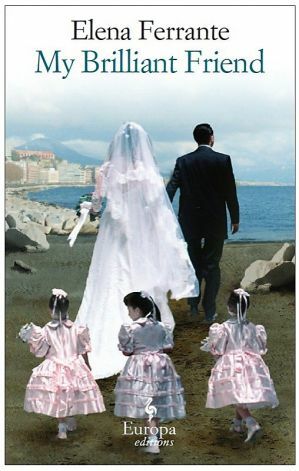 - Read a review of the latest Elena Ferrante novel. Need to read her next. Read and loved all the Ferrante. Back onto Morante - finished Arturo's Island earlier today and this is really way better than History. There is a sentimentality to it that feels off to me. Arcoeli sounds unsparing as well. Both books are written from the POV of men. Also saw Straub/Huillet's Sicilia!, their adaptation of the Vittorini. If you ever get a chance you are in for a treat. i bought _days of abandonment_ and am excited to read it but the US editions of her work have the ugliest covers i have ever seen on a "serious novel." The cover of My Brilliant Friend signifies when you get into the last section, re the wedding. Finsihing a couple of Natalia Ginzburg novellas. In Velentino there are three births, three deaths (one a suicide of course), a wedding, another aborted wedding, all told matter of factly in 45 mins. Its just life, in all its disappointments. Sagitarius is even better. Here the mother - daughter relationship is complex. In Italian novels I get the impression the mother is a village simpleton but here it seems she is more of a frustrated wannabe intellectual. Thanks. I've got a copy of The Periodic Table somewhere around here, in case I haven't mentioned it before, IN ITALIAN!!!! This is better, maybe because the argument for a darker conclusion is made to stick. haha when I linked that it hadn't been opened up for non-subscribers. This series of blog posts on the Levi set has turned into a monument of crank. I stare at Brock's Pavese everytime I find myself in the LRB bookshop but don't want to stump up 18 quid or whatever. Could send me over the edge tho'. I get that Parks wants a more down-to-earth translation (I get that Ann Goldstein is possibly too boringly literary). They are v good pieces - and they have certainly sharpened my sense of what is really translating into English or not. otoh great writing translates even if translated badly (or if the editing is bunk). Parks is very entertaining, though. I really enjoyed his collection of those NYRB pieces that came out last year (this year in the US). Who's Ippolito Nuevo, btw? A quick Googling gets me only stuff I cannot understand. Really want to read the above but no subscriber. Now i feel even dumber, as i own but have not read that book! Had an idea to poll off-the-classics-lists from the 19th century. Totally arbitrary list -will have to read and put that in if I like it. This looks so much more interesting than Manzoni but I'm indie like that. Thanks James! ha, Parks compares it to Manzoni at the end. Ferdinando Camon's trilogy "The Fifth Estate" / "Memorial" / "Life Everlasting" is my current Italian tip. The absence of matching English editions of the three is a matter of great regret IMO. The Morante sounds very exciting: I've been meaning to read her for a long time, but I'm not sure where best to start. ows - def Arturo's Island if you can get hold of the out of print copy (did via my library). Arcoeli is on Open Letter and I was talking to someone abt it on twitter as she was raving about it (its how I found out about this). Historia was good at the time and is disappointing when set against her other fiction. I just read "The Unseen" by Nanni Balestrini and it's a fierce novel of (and from) the Autonomia movement of the 70s/80s, brutal, angry, upsetting and highly recommended. Read the Ginzburg in the old translation and its fkn great. Saba is unknown to me and I'm excited. (I get that Ann Goldstein is possibly too boringly literary). Maybe somewhere, but not in the Neapolitan Novels. Got to read this fantatsic piece on Elsa Mornate at the weekend. Not just a review of that book but a beautiful overview of all her works and the little of crit published in English. A must. So I called Gadda showy for Acquainted with Grief above in the William Weaver translation but now I see Experience of Pain is coming out (I assume its a re-translation as it has a similar set-up, words in either title amount to same). And I need to read some Bassani - its a gap. Just been reading him, so thanks for that! ah yeah I saw that.